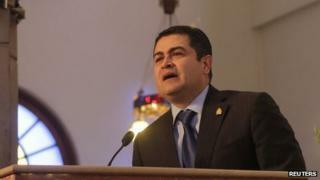 Honduras has suspended eight of its 10 consuls in the United States. Honduran President Juan Orlando Hernandez said there would be an investigation into whether the eight had illegally issued identity papers. The consulates affected are in Atlanta, Chicago, Dallas, Houston, Los Angeles, Miami, New Orleans and New York. The consuls' suspension comes days after local media alleged that they had issued illegal papers in exchange of payments of up to $50 (£30). The only ones to remain in their posts were the consuls in Washington DC and San Francisco. An estimated 700,000 people of Honduran origin resided in the United States in 2011, according to the US Census Bureau. The case came to light after a group representing Hondurans living in the US said a number of consulates were issuing "consular IDs" - documents that bear the crest and flag of Honduras, but which are not officially recognised forms of identification. President Hernandez said in a statement that such documents were "false" and that any consular staff issuing them would be penalised. Jorge Rivera, of the Honduran Unity group in Dallas, Texas, said he knew of at least four consulates that had issued such IDs. "They're selling them for $50 in a number of places and I don't know how the consulates can be doing that because that document is not an approved document," Mr Rivera said. "They're just trying to make money," he added. Expatriate Plinio Rodriguez said that the Honduran consulate in Los Angeles had issued him with a "consular ID", which he said he had found "very useful". Mr Rodriguez told Honduran newspaper La Prensa that the ID was widely accepted by US authorities and even got him access to the prison in California where his son was serving time. He said he had not been charged for the ID, but knew of others who had.